This week it's the former middle-weight contender turned comedian - John Pinney. He'll be on stage along with Homer Shadowheart. For our website followers - call and make reservations and tell us you want to see a "TKO", and you'll get $5 off of any ticket for this weekend..
Don't forget that we are now operating on our winter schedule. Shows are at 7:15 & 9:30. The Holidays are here. Keep the Comedy Caravan in mind for your gift-giving. We have gift certificates available for $25 and $45, "I'm Free Wednesday" T-Shirts for $40, and VIP cards for $250 & $350. Call the club for details. Why not give the gift of laughter this year. After all, EVERYONE can use a good chuckle. Remember our discount specials - - 1) An unemployment stub equals free admission; 2) Check in with us on Facebook and get $2 off your admission; 3) Military personnel get a $4 discount on ANY show; 4) College I.D. 's = $4 discount. And be sure to keep an eye out for our Living Social & GroupOn offers. Our Comedy Cruises on the Spirit of Jefferson have been a HUGE hit. Departing at 11:00 p.m. and returning at 1:00 a.m. Kick off your weekend with a laugh. Scheduled dates are Dec. 2nd & 23rd. Come join us for comedy on the Ohio. Come check out our "Caravan - RAW" - hosted by Jay Cox each Wednesday. Show starts at 7:15 (doors open at 6:30). Raw & uncensored. Admission - $3.00, with NO drink minimums. Open to 18 & over. Thursday nights at 9:30 it's "The List"., hosted by Bryan Kennison. Think you're funny? Be one of the first 12 to say "Put Me On The List" and get 3 minutes. Admission - $1.00, & no minimums. Show everyone how funny YOU are (or not). Be sure to follow us on Twitter, ComedyCaravanKY. We'll be dropping interesting tidbits and some special Twitter Only discounts and freebies. Sign up today! 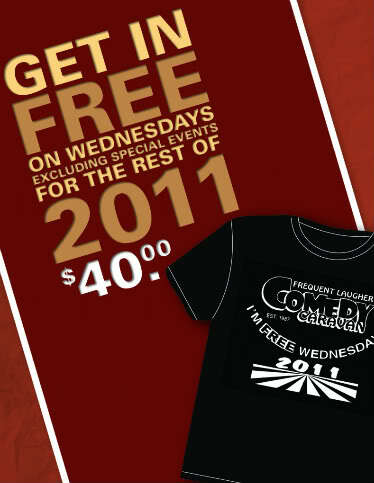 Buy a T-Shirt and get in FREE every Wednesday for a full year. And, they make GREAT gifts! After the Caravan RAW show, Jay talks with Spanky Brown, Barb Neligan and Dwight Angelo about topics like; Rabid Monkeys, Project Runway, Escaped Wild Animals and of course the comedy they will be performing at the Caravan this week! Kris King catches an Etta May Show with Tim McClendon and interviews a drunk audience member "Drunk Sandy"! Great Podcast!